While shopping at Farm to Family earlier this week for my rabbit (more to come on that), I picked up a pound of ground lamb sourced from Mount Vernon Farm in Sperryville, Virginia. 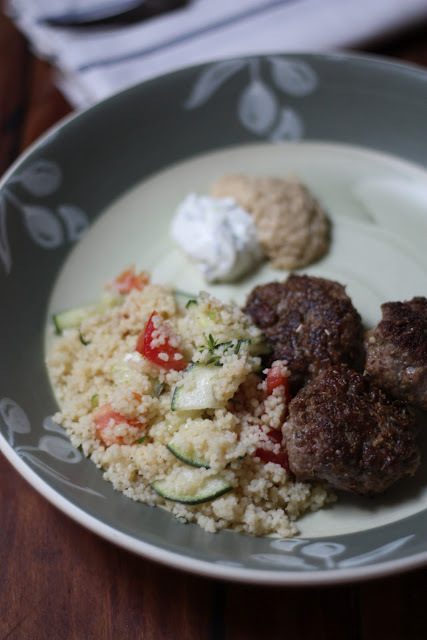 Mary and I love making these mini Mediterranean inspired lamb burgers with couscous so I'm sharing with you today how we go about it — a really quick and easy way to put a flavorful dish on the table that people will think took you hours to create. Mix salt and pepper to taste in the ground lamb and make small patties like your are going to make some sliders. Dredge the burgers in the spice mixture and cook on the stove-top, about 4 minutes per side for medium. This works really nicely in a cast iron pan. Make couscous according to the package directions and mix in the diced vegetables (I also tossed in a little fresh thyme to garnish). Serve with hummus and tzatziki on the side. As I mentioned there is a wonderful combination of flavors going on in this dish that takes you to a Greek isle while you are enjoying it. If you have shied away from lamb, this is a good recipe that has training wheels. My husband and daughter are both fond of lamb, me, not so much. I am always being asked to make it and so I'm excited to see this post. I will try it and see how it goes. At the very least, I will be very happy with the sides. Well I am sure it will be a hit for your husband and daughter! Let me know what you think! If it turns out you still do not like the lamb enjoy the sides! I think that looks so stinking good! And just think if, for some ungodly reason there are left over meatballs you could make a grilled Mediterranean pizza.